Just How Dirty is Lee Green’s Air? Very is the unsurprising answer. A recent pollution study has found that the Tiger’s Head intersection of Lee High Road, Lee Road, Eltham Road and Burnt Ash Road registers 75% over legal limits for pollution. Anyone who regularly walks or driven through that crossroads will already be familiar with the sheer volume of traffic which crawls through the junction, especially at peak times. A Better Lee Green is the campaign group which commissioned the independent Pollution Study of our local area in response to St Modwen’s plans to build a massive ASDA superstore on the Leegate site. This week they released their findings. A Better Lee Green’s Findings-March newsletter.Sign up here to receive updates directly. St Modwen, have submitted their plans to develop Leegate with the proposed Public Space stretching up to 16 metres back from Burnt Ash Road. 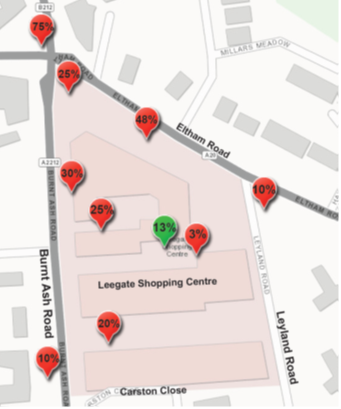 In January – February 2015, Network for Clean Air and A Better Lee Green partnered to hang nitrogen dioxide detecting tubes in the Leegate Shopping Centre and its surrounding areas. % Below EU Nitrogen Dioxide legal limit. – Tube in the centre of the current, sheltered square 13% below the legal limit. – Tubes placed near high buildings measured higher than those placed near similar levels of traffic near open spaces. (Note: Vehicles travelling along Burnt Ash Road will increase by several thousand cars per day under St Modwen’s proposed plans). Effects of Pollution: Prolonged exposure to nitrogen dioxide and pm2.5 (both emitted by vehicles) causes respiratory problems, can lead to cancer and can affect the development of children’s lungs. Deaths in the UK from these pollutants are predicted to be higher than those from smoking alone and those from obesity, traffic accidents and alcoholism combined in 2015 (Government figures). St Modwen claim that planting trees will solve additional pollution caused by their new superstore. Trees and greenery serve an important role in psychological wellbeing, biodiversity, drainage and flood alleviation. However, they cannot be relied upon to adequately absorb these levels of pollution. Trees at ground level currently do not absorb existing pollutants and the levels of pollutants will increase with St Modwen’s plans. St Modwen believe their proposals will not bring more congestion and pollution problems to the area: Asda will be as big as Sainsburys, which receives around 45,000 visitors per week, estimated over 60% by car. Who do St Modwen expect to park in the 100’s of proposed parking spaces? Make Leegate Green: Local groups including the Lee Green Local Assembly Leegate Working Group, Lee Manor Society and A Better Lee Green fully support Leegate’s redevelopment but call for public space to be moved to the centre of the development and for a smaller store which would attract less traffic. This study offers strong evidence for these demands. YOUR COMMENTS MAY NOT BE CONSIDERED VALID OTHERWISE. Lewisham Planners have informed us they do not have the resources to display your comments on their online planning portal. A huge thank you to Network for Clean Air for their guidance and time. Last minute community meeting @ Trinity School ahead of Leegate consultation deadline. Lee Green Women’s Institute are to hold an open meeting about the Leegate consultation. Trinity School in Taunton Road, (near Sainsbury’s). Doors open at 7.15 for a 7.30 start. Letter from Julie Williams, local resident. I’m getting in touch to let you all know there are only a few days left to leave feedback online for the planned Leegate redevelopment. I know many people were unable to make it along to the consultation, so if you did miss it, you can see the plans on the following website. The St Modwen deadline is Friday 11th July. I presume this means midnight but I wouldn’t leave it this late, just in case! I would also like to encourage anyone and everyone to come along to a talk about the Leegate plans this coming Monday….sorry it is such short notice. Our local WI group are hosting the evening. They are inviting local residents (male and female!) and anyone who is interested to come along and hear Killian Morris, the senior development manager for St Modwen (the owners of Leegate), give a presentation on their proposal. Hopefully there will also be time for a question and answer session afterwards. The WI will be selling refreshments, hopefully lovely homemade cakes, to raise money for their funds. Please try to come along if you possibly can. We are unsure whether it will be well attended because we only have two days left to let people know. I would be very grateful if you can pass these details on to anyone that you think might be interested, particularly residents who did not receive the invitation to the public consultation. According to investigations undertaken by the Costcutters on Staplehurst Road, the Biscuit Factory development trail seems to lead to Tesco. Not surprisingly the family-owned supermarket which has served Staplehurst Road for over 20 years aren’t happy and neither are other local businesses. Between the promised ASDA development at Leegate and the possibility of a Tesco opposite their own store, Costcutters have started a petition. To support them sign here. Hither Green Clock Tower/ Meridian South- Tesco Express.